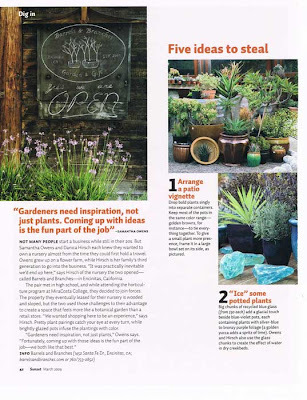 My family was all abuzz over this article in Sunset magazine over Easter. 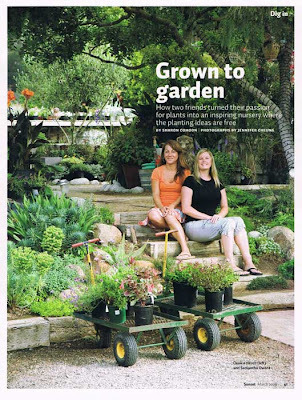 Check out these talented gardeners at their nursery in Encinitas, CA at http://www.barrelsandbranches.com/site/. The girls grew up in the same area as I did and look to be about my age- it's inspiring to see girls my age doing something so fun and successful with gardening. I love the decorative ideas for the garden. I actually do have some of that gorgeous blue glass slag I purchased at Lotusland. 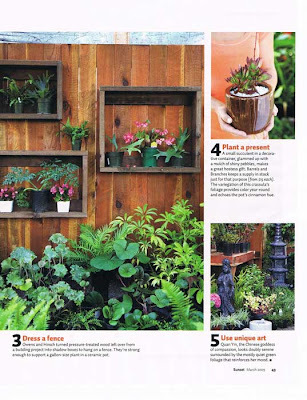 I also absolutely love the idea of the window boxes as shelves for plants on the fence. I would love to try this in my yard but our fence is so old and haggard I'm afraid it couldn't hold the weight. I can't wait to visit when I am down in SD again! I am actually looking for the right type of wood to make those window boxes, I want to display different styles of terrariums. I love that look it really brings interest especially indoors rather than out. Thank you for stopping by my blog I have been enjoying reading yours and I'm loving this window box idea ... too cool !! Have fun when you get to visit and make sure you share pictures with us.